Authors: Pieter van Dokkum, Roberto Abraham, et al. Figure 1: Also Figure 1 from the paper, showing Dragonfly 44 and its surroundings. It was made by combining deep g and i images from Gemini. The galaxy galaxy is spheroidal with low surface brightness. If you ever find yourself in an area with little light pollution, go outside on a clear night and you’ll be able to see some of the hundreds of billions of stars that make up the Milky Way. You’ve probably heard by now that they account for a scant 5% of the mass of our galaxy—the rest is made up of dark matter. This might seem like a high ratio of dark matter to visible matter, but it is nothing compared to the amount of dark matter astronomers think could make up some of our ‘darkest’ galaxies. 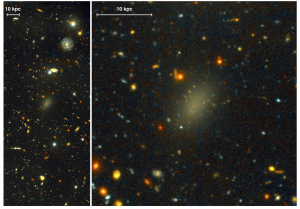 The focus of today’s paper is an ultra diffuse galaxy called Dragonfly 44, located approximately 100 Mpc away. It is roughly the same size as the Milky Way, with a similar estimated dark matter mass, but has only 1% as many stars. Astronomers have known about the existence of ultra diffuse galaxies (UDGs) for decades, but it was only recently that we discovered that they were much more common than we thought. More than 850 of them have been discovered in the Coma cluster alone, and many more have been located in other dense environments as well. Unlike our own barred spiral galaxy, UDGs are usually round, red, and featureless, with low surface brightness, as can be seen in the two images of Dragonfly 44 in Figure 1. They have been noted to resemble dwarf spheroidal galaxies but are an order of magnitude larger, similar in size to our own galaxy. Despite finding many more UDGs, we still know very little about them. How did they form? Could they just be bloated dwarf spheroidal galaxies? Or could they more similar to bigger galaxies like the Milky Way? How massive are they? We often assume that more light is an indicator of mores mass at a certain location, but that’s not always true when dark matter is involved since it doesn’t interact with light. UDGs, which have been discovered in galaxy clusters, have been hypothesized to have a very high mass-to-light ratio, because the amount of mass that their low surface brightness suggests means they could easily be torn apart by tidal forces. The authors of today’s paper use their observations of Dragonfly 44 to answer these questions. The galaxy gets is name from the Dragonfly telescope (made up of an array of commercially-available lenses) used to discover it. Figure 2: This is Figure 3 from the paper. The left plot shows the mass-to-light ratio plotted against the mass (both derived from measurements of the stellar velocity in the galaxies) for a two UDGs, VCC 1287 and Dragonfly 44, and other galaxies from previous papers. The two UDGs don’t fall in with the other galaxies. On the right, the number of globular clusters is plotted the dynamical mass. Dragonfly 44’s result is in black and and falls within the values expected from other galaxies of the same mass. This demonstrates its similarities to other galaxies of comparable mass when luminosity is not considered. Dragonfly 44 is the second largest of the 47 UDGs the authors had discovered in the Coma cluster in a previous paper. Since it is the only UDG that was spectroscopically-confirmed (the redshift of the galaxy matched the redshift of the Coma cluster) to be in the Coma cluster, this made it an ideal target for study. Using measurements of the velocity of stars in the galaxy along with the estimated half-light radius of the galaxy, the authors were able to obtain estimates for both the mass of the galaxy and the mass-to-light ratio contained within the half-light radius. This results in a dark matter fraction of approximately 98%—enough mass to explain why the galaxy had survived being so close to the center of the Coma cluster. This also allowed them to confirm that Dragonfly did indeed have similar mass to the Milky Way, rather than being an extended dwarf galaxy. In addition to calculating the high mass of Dragonfly 44, the authors also found 35 globular clusters within the half-number radius for globular clusters (their distribution tends to be more spread out than that of stars), and they estimate that there are approximately 100 globular clusters in the entire galaxy. A “half-number” radius is similar to the concept of a half-light radius, except it is the radius that is expected to contain around half of the globular clusters in the galaxy rather than half of the light. This number of globular cluster is an order of magnitude larger than what would be expected from galaxies of similar luminosity to Dragonfly 44, but is similar in number to what would be expected from galaxies of similar mass as Dragonfly 44. These results can be seen in Figure 2. The large mass and number of globular clusters indicate that Dragonfly 44 (and other UDGs) are likely to be more closely-related to galaxies like our own than the dwarf spheroidal galaxies that they resemble. Instead, the authors suggest that they are really “failed” versions of galaxies like our Milky Way—galaxies that normally would be expected to have much more star formation. Far from closing the book on the mysteries of UDGs however, these findings leave us with many more questions to answer. We still don’t know what physical processes are behind the lack of star formation in UDGs. In addition, the authors estimate that the halo mass of Dragonfly 44 puts it right where the ratio of stellar mass to halo mass for a galaxy should peak, meaning that it is 100 times less bright than we would have previously expected. It’s worth noting, however, that the authors extrapolate the mass they derived from within half-light radius by about two orders of magnitude in order to arrive at an estimate of the halo mass. Only more research will be able to tell us if this really is at conflict with our current understanding of the relationship between halo mass and star formation.